Our spacious double bed rooms Includes 2 Queen or 2 Double size beds with very comfortable high quality mattresses helps to ensure a good nights sleep. 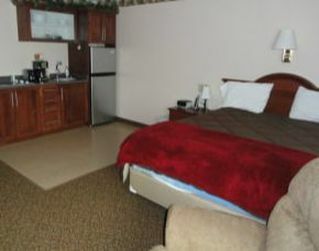 All rooms have a small Refrigerator, Micro-wave, Iron and Ironing board coffee maker and Flat screen TV. All rooms have access to Ivey's Wire-less internet at no additional cost. A ""Fresh Start Breakfast" is available to all registered guest at Ivey's Motor Lodge. Items included are Dry cereal, Scrambled Eggs, Bacon Sausage, Coffee, Tea and an assortment of Breads and Bagels. Our spacious double bed rooms Includes 2 Queen or 2 Double size beds with very comfortable high quality mattresses helps to ensure a good nights sleep. Our spacious double bed rooms Includes 2 Queen or 2 Double size beds with very comfortable high quality mattresses helps to ensure a good nights sleep. All rooms have a small Refrigerator, Micro-wave, Iron and Ironing board coffee maker and Flat screen TV. All rooms have access to Ivey's Wire-less internet at no additional cost. A ""Fresh Start Breakfast" is available to all registered guest at Ivey's Motor Lodge. Items included are Dry cereal, Scrambled Eggs, Bacon Sausage, Coffee, Tea and an assortment of Breads and Bagels. 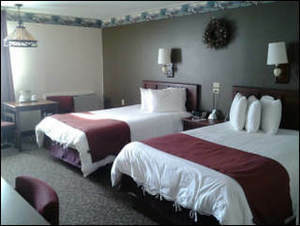 â€‹Ivey's Motel has the most advanced handicapped accommodation rooms available for your convenience. These rooms have extra wide doors to make entering by wheelchair so easy. Ample floor space allows you room to turn and move around easily. No tight corners or cramped feeling. You are at Ivey's and we have tried to anticipate and prepare all the accommodations you may need. All rooms have a small Refrigerator, Micro-wave, Iron and Ironing board coffee maker and Flat screen TV. All rooms have access to Ivey's Wire-less internet at no additional cost. A ""Fresh Start Breakfast" is available to all registered guest at Ivey's Motor Lodge. Items included are Dry cereal, Scrambled Eggs, Bacon Sausage, Coffee, Tea and an assortment of Breads and Bagels. One Queen Bed. 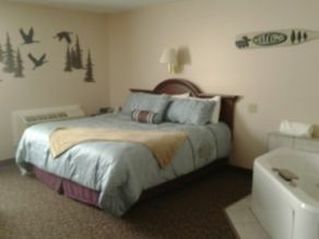 All rooms have a small Refrigerator, Micro-wave, Iron and Ironing board coffee maker and Flat screen TV. All rooms have access to Ivey's Wire-less internet at no additional cost. A ""Fresh Start Breakfast" is available to all registered guest at Ivey's Motor Lodge. Items included are Dry cereal, Scrambled Eggs, Bacon Sausage, Coffee, Tea and an assortment of Breads and Bagels. This spacious room includes a King Size bed. This room includes a full bath with shower and all the other amenities that Ivey's has to offer. This room will make your stay at Ivey's a truly memorable experience. All rooms have a small Refrigerator, Micro-wave, Iron and Ironing board coffee maker and Flat screen TV. All rooms have access to Ivey's Wire-less internet at no additional cost. A ""Fresh Start Breakfast" is available to all registered guest at Ivey's Motor Lodge. Items included are Dry cereal, Scrambled Eggs, Bacon Sausage, Coffee, Tea and an assortment of Breads and Bagels. 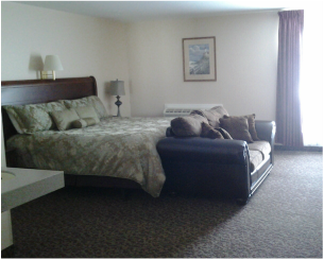 Our Efficiency Suite with recliner offers a King bed with a Full Kitchen. The kitchen is stocked with pots, pans, utensils and dishes along with the standard amenities. All rooms have a small Refrigerator, Micro-wave, Iron and Ironing board coffee maker and Flat screen TV. All rooms have access to Ivey's Wire-less internet at no additional cost. A ""Fresh Start Breakfast" is available to all registered guest at Ivey's Motor Lodge. Items included are Dry cereal, Scrambled Eggs, Bacon Sausage, Coffee, Tea and an assortment of Breads and Bagels. 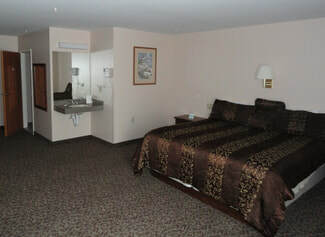 â€‹This spacious room includes a King Size bed with a whirlpool bath right beside it. This special room is the perfect place to spend your birthday, honeymoon, or anniversary. This room includes a full shower and all the other amenities that Ivey's has to offer. This room will make your stay at Ivey's a truly memorable experienceAll rooms have a small Refrigerator, Micro-wave, Iron and Ironing board coffee maker and Flat screen TV. All rooms have access to Ivey's Wire-less internet at no additional cost. A ""Fresh Start Breakfast" is available to all registered guest at Ivey's Motor Lodge. Items included are Dry cereal, Scrambled Eggs, Bacon Sausage, Coffee, Tea and an assortment of Breads and Bagels..